Kyrenia City is perhaps the most attractive town there is in North Cyprus and with good reason too. Kyrenia is home to a beautiful harbour and some golden sandy beaches. There is a fascinating old part to this city and no matter where you are staying in North Cyprus for your holidays Kyrenia City or Girne as it is locally called is a must see. The first settlers to Kyrenia were the mainland Greeks and they used the local stone that was quarried here to build their own town. By the time the Romans arrived Kyrenia was a very popular town and had become well established. Kyrenia’s walls became its main defence during the 17th Century when the Arab began to invade. Living on the coastline was very dangerous during this time but Kyrenia had its defence in Kyrenia castle. Four castles have since stood in its place and all four overlooked the modern harbour that you see today. When the Venetians came to Kyrenia during the 1300’s the town itself was already well defended. The castle had a moat around it and the ports entrance was secure. 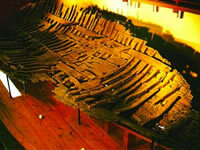 No ship could enter without being granted permission and the port was held secure by a chain that went right across it. The Venetians during their time improved on Kyrenia’s defences. They enlarged the castle and formed the shape of the harbour into what it is today. They also constructed a number of excellent buildings in the town and the most popular is the Folk Museum which you can still visit today. The Venetians lost power to the Ottoman military in 1571 and many of these soldiers stayed here to help colonise the island. With the Ottoman Empire in full control most of the settlers who choose to come here were given very generous tax breaks and incentives. By the year 1878 there were over 95,000 Turkish Cypriots living here. During the early 1800’s the there were very few families living in Kyrenia but by the early 20th Century this has grown to thousands. 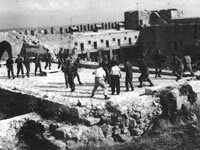 When the British gained control, Kyrenia became a popular retirement area and is still seen that way today. 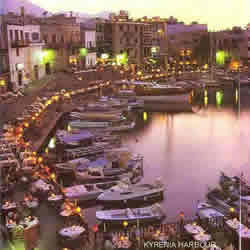 You only have to look at Kyrenia harbour to see why it is such a popular place to visit. The arc of the harbour is filled tables from the local restaurants and cafes and is an excellent location just to sit and watch the world go by. Many of the old carob warehouses have also been converted into shops and restaurants which help to make the harbour seem full of life without ever feeling overcrowded. Kyrenia Castle is located at the mouth of the harbour and is the central attraction. You can visit and explore the castle and from the top the views are spectacular. Inside the castle you will also find the Kyrenia Shipwreck Museum where you can see the remains of an ancient trading ship that was taken from the harbour and preserved. This is a wonderful place to visit and a definite must see during your holiday in North Cyprus. Just a short distance from the harbour is the narrow streets of Kyrenia city where you will find a range of shops, historic buildings, and workshops. The Djafer Pasa mosque can also be found here which dates back to 1570. Wondering up and down the steps that link all the streets in Kyrenia is a wonder to behold and you are advised to take your time and admire all that is on offer. There is a local municipal market where you can purchase fruit and vegetables. Underneath your feet as you walk are over 70 catacomb tombs. These tombs were cut into the limestone that has long since been built over. Kyrenia is also home to the Icon Museum and much more. If you are not staying in or around Kyrenia and you have a hire car a day trip here is something that you definitely won’t forget in a hurry.